Original receipt, manuals, accessories etcetera will be required to process all returns and/or exchanges. - Any shipping damage must be reported within 24 hours of pick up or delivery. - All Floor-Model and Clearance item sales are final; no returns or exchanges. - * Special-order items are non-returnable. - Delivery charges are not refundable after delivery. We will credit the full cost of your unused appliance towards the cost of a replacement appliance of equal or greater value within 30 days of delivery/pickup. We reserve the right to request a Service Technician examine/repair any defective item(s) still under warranty before agreeing to a return/exchange. Unused appliances may be returned if request is made within 24 hours of delivery or pickup. A 10% restocking fee plus any related delivery fees will be charged, and other costs including any prior delivery costs will not be refunded. We will make every effort to cancel your order before the manufacturer ship date. However, this is not always possible. Where we are not able to cancel a 10% restocking fee will be applied to any shipped items. We will credit the full cost of your unused mattress or unused mattress set towards the cost of a replacement mattress or mattress set of equal or greater value within 30 days of delivery/pickup. Returned goods must be unused and in the original sealed packaging with the original sales receipt. For health reasons, there are no returns/exchanges on used sleep sets unless done under *Manufactures Warranty. Note that the manufacturers warranty is void if “Fabric Stains, soiling, fluid penetration, tears or burns” are evident. We recommend that you purchase a mattress protective cover on the same invoice to ensure this is not an issue down the road. 90-Day Sleep Comfort Guarantee: Adjusting to a new mattress set can take time. The less support your old mattress provided, the longer this adjustment period may take. For this reason, we ask that you sleep on your new mattress set for a minimum 30 days prior to requesting an exchange. We offer a one-time reselection to a new mattress/set within 90 days of pick-up or delivery when purchased with a mattress protector, excluding any Galaxy Bed-In-A-Box purchases. If your new mattress selection is of lesser value than original purchase, we'll refund the difference; if the value of your new mattress selection is more you will just be charged the difference from original purchase. If your appliance is in need of service just phone, fax or email one of the Sunshine Coast's professional appliance technicians for a service call. coverage period of the Plan. the procedure for obtaining a refund. same major part during the coverage period of the Plan. button (s) by mail to the Plan owner. 5. Repair damages due to power surges. • That affect a washer’s tub, a dryer’s drums or a dishwasher’s baskets. available for all products, during a single technician visit. 9. Replace the product that is subject to a failure covered by this Plan. 12. Comerco may, at its sole discretion, decide to replace a product rather than repair it. will be finalized by a Comerco authorized retailer. • in any other circumstance for which, at Comerco’s discretion, a repair is not considered. obligations and the coverage will become null and void on that specific product. as determined by the technician. may obtain a full refund from the retailer. 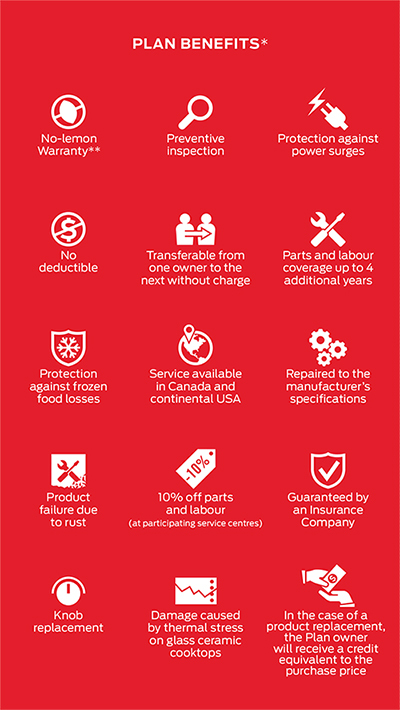 parts and/or labour costs that are covered by a manufacturer’s warranty or an insurance policy. parts covered by a manufacturer’s warranty. 19.2. Warping or caving in of the structure. costs for the replacement of sealed batteries that are not accessible to the Plan owner. 19.6. Satellite antennas, cables, shelves, drawers as well as the cleaning of glass and screens. 20.2. Noise and product performance which are not caused by a failure. encounter in accomplishing the required repairs. the Plan. The Plan owner is entirely responsible for the recovery of such data. the product for its correct functioning, in accordance with the guidelines set forth by the manufacturer. technician, the removal and reinstallation of a product that is not readily available. incurred costs without which the benefits of the Plan will be suspended until said payment is received. The duration of the Plan will not be extended in the event that a suspension of benefits occurs. purchase invoice may be required. servicerequest or by contacting Customer Service at 1-877-710-4653. Comerco may assign, in whole or in part, its obligations under the Plan. completing the request online at www.comerco.com/ownertransfer. 1. This transaction is between the Plan owner and The Nordic Insurance Company of Canada. representing The Nordic Insurance Company of Canada. 3. The nature and extent of the interest of the dealer in The Nordic Insurance Company of Canada is none. of Canada through a fee paid out of the purchase price of the contract. financial institution or any other person or corporation as a condition of this transaction. contract is absolutely barred unless commenced within the time set out in the Insurance Act. These terms and conditions of use (the “Terms and Conditions”) apply to the website located at //www.sscapplianceandmattress.com/ and/or its mobile applications. The Site is maintained by or on behalf of Sunshine Coast Appliance and Mattress Experts. Your use of the Site constitutes your unconditional agreement to follow and be bound by these Terms and Conditions. IF YOU DO NOT ACCEPT THESE TERMS AND CONDITIONS OF USE, PLEASE DO NOT USE THIS SITE. The Company reserves the right to modify these Terms and Conditions at any time by posting revised Terms and Conditions on the Site without prior notice. You should visit this page from time to time to review the current Terms and Conditions. Your continued use of this Site following any such modification will signify your unconditional acceptance of the Terms and Conditions, as modified. The Company uses commercially reasonable efforts to ensure that the information appearing on the pages of the Site are up-to-date and complete and contain no inaccuracies or errors. Despite all our efforts, some errors may occur, and the Company will do everything possible to ensure these errors are corrected as soon as reasonably possible. The Company and its affiliates, directors, employees, officers, shareholders, agents, website designer and website provider (collectively the “Associates”) make no representation as to the completeness, accuracy or correctness of any information on the Site. You may download copy and print selected portions of the Content and other downloadable materials displayed on this Site for your personal, non-commercial use only, and if you maintain all copyright and other notices contained on the Site or in the Content. Except as noted above, you are not authorized to use, reproduce, print, store, re-edit, change, download, sell or otherwise copy the Content or any other element of the Site, whether in whole or in part, for any other reason or for purposes of publication, dissemination or sale, on any medium or any format whatsoever. Be advised that the Company will fully enforce its intellectual property rights. You represent that all the information, data and other materials you provide on this Site or to the Company through any other means are true, accurate, current and complete. You are responsible for correcting and updating the information you have provided on this Site, as appropriate.